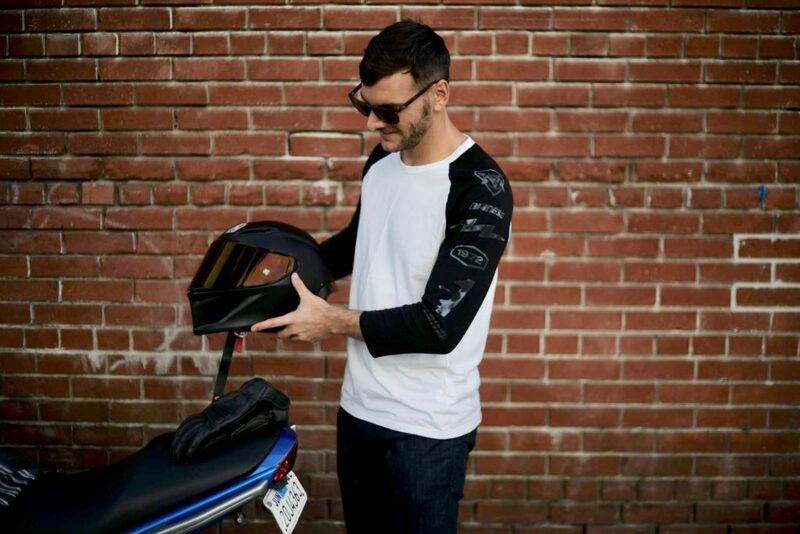 Few brands have made as significant an impact on motorcycle safety as Dainese. Since company founder Lino Dainese spotted his first set of leathers on some “ton-up” (touring bike) riders in 1968, he dedicated his life — and his future enterprise — to protecting motorcyclists. Intensive research and testing in motorsport, laboratory, and real-world environments have yielded a number of critical safety developments. The first back protector, knee sliders, aerodynamic hump, boot sliders, carbon fiber gloves, and motorcycle airbags are all credits to Dainese. It wasn’t long before the company expanded its efforts to support skiers, mountain bikers, and equestrian riders as well. Today, the company (which includes AGV helmets) continues to introduce life-saving gear to motorsports before bringing polished products to everyday riders. This process not only refines and proves the tech but also enhances its comfort and style en route to daily usability. 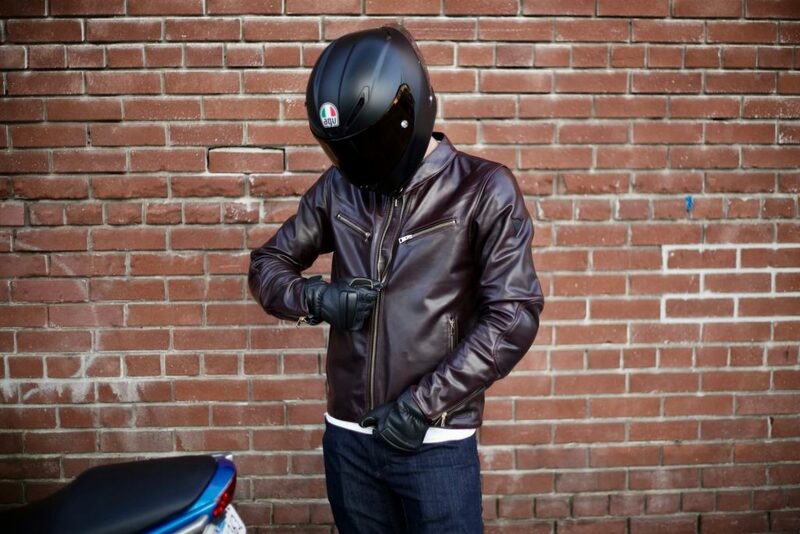 Leave it to the Italians to make protective gear a fashion statement. The crown jewel of the Dainese72 heritage collection, the Patina72 is made from soft drum-dyed leather with a special liner created by Othelo Gervacio. The shoulders and elbows are protected by removable soft Pro-armor certified to EN 1621.1 standards and a G1 or G2 back protector can slot into the included pocket. It seems like every time I go for a ride, someone compliments the jacket or asks where he or she can get one like it — most inquirers aren’t even riders. Each Patina72 looks slightly different due to the patina process, but the deep maroon color and soft leather shell on every example are spectacular. The fit is cozy in the arms, so if you have a very muscular build, you may want to look into a different style. Otherwise, there’s plenty of flex to be comfortably crouched over your bike’s handlebars for hours at a time, or, in my case, strolling around town (because I never want to take the darn thing off). There isn’t much to the Thunder72 3/4 shirt, but its 100-percent cotton construction and long torso make it the perfect base layer for a comfortable ride. On short trips, the light, breathable material stays dry so you can simply peel off your heavy outer layer at your destination and go about your business. On longer hauls, I’d recommend bringing a spare Thunder72 to change out for the return trip. Like the Patina72 jacket, the Strokeville jeans can easily be confused for trendy, pedestrian attire. Available in black or blue Aramid denim, the pants are woven with DuPont Kevlar with extra Kevlar reinforcements behind the knees, hips, and seat. Every pair comes with Pro-Armor padding in the knees and you can add Pro-Shape armor to the hips. The style is slim-cut mid-rise with plenty of space in the thigh. After protection, comfort is the biggest plus to this pair of denim. 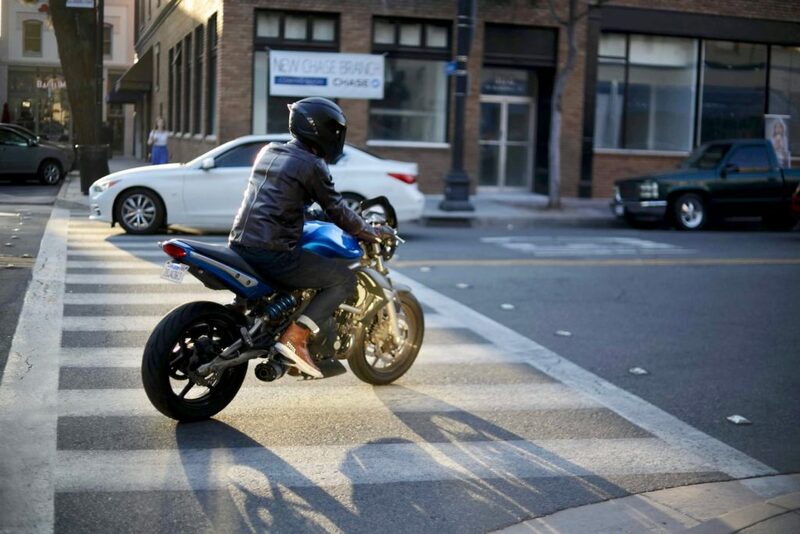 On both sport and superbikes, the jeans don’t cut off circulation at the knees so you can stay relaxed on long rides. With the cuffs rolled and when rocking one of the boots below, this is just a badass pair of pants you won’t be in a rush to change out of. 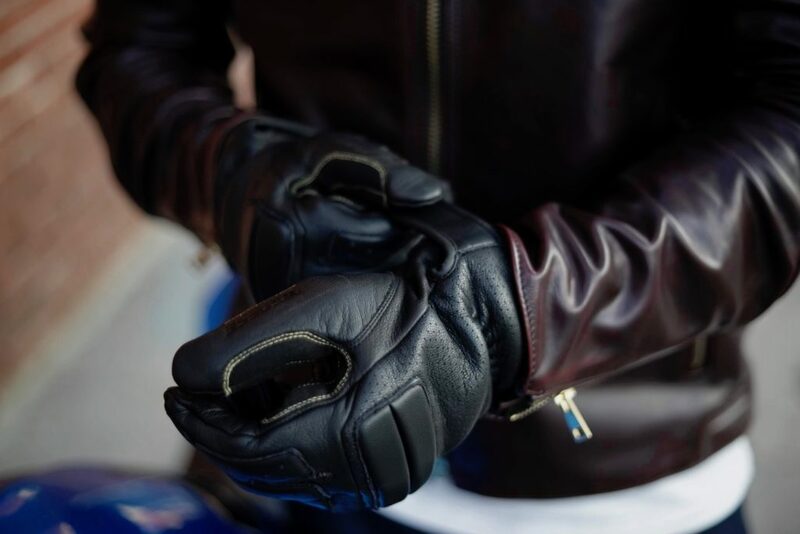 Another highlight of the Dainese72 heritage collection, Pelle72 gloves are modeled after the first mitts Dainese ever produced. A classic look benefits from contemporary materials including goatskin leather and Aramid fiber stitching. Both the palm and knuckles are reinforced for skid protection, but these won’t have the same level of impact durability as Kevlar- or carbon fiber-reinforced handwear. Breathability and soft lining make this among the most comfortable hand protection out there. This isn’t a flashy set of gloves, but that means they go with just about any outfit. For cruising around town, these are great, but I’d also recommend a heavier duty set with more wrist and knuckle protection for spirited riding. 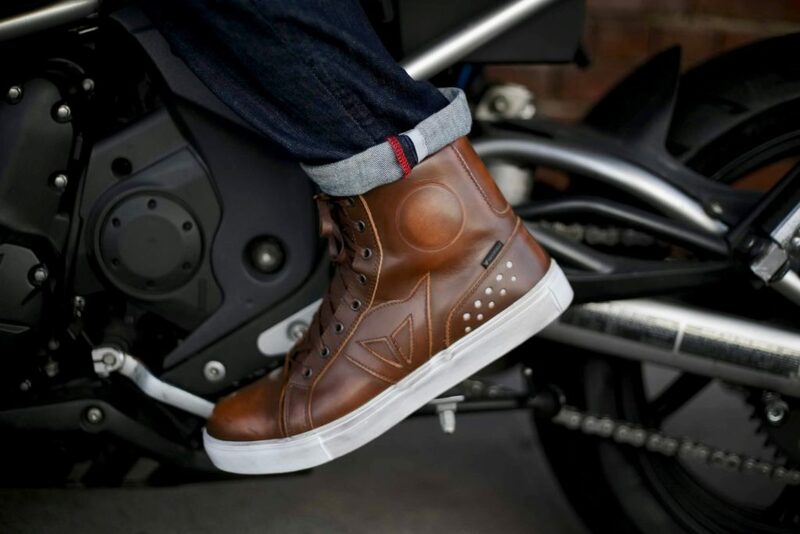 The Street Rockers are another example of moto accessories you’ll love wearing on and off the bike. Made from full-grain cowhide, each shoe gets a hand-finished treatment so no two pairs are alike. The Rockers have a waterproof/breathable D-WP lining and a CE-approved safety rating. Riders can choose from black, tan, or dark brown colors. The pre-worn, grungy look may not be for everyone, but I love the Converse-esque style as opposed to traditional, clunky moto boots. 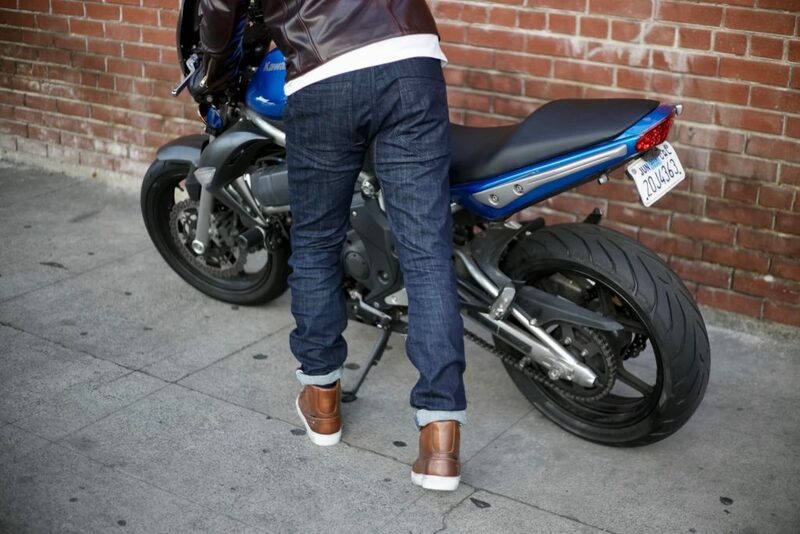 In tan, the Rockers nicely contrast the plum shade of the Patina72 jacket and deep blue of the Strokeville denim. Walking around, the shoes are comfortable, but tucked to the sides of the bike, the ankle supports pinch a bit (not unbearably so). I expect a little more time in the saddle will relax the fit. 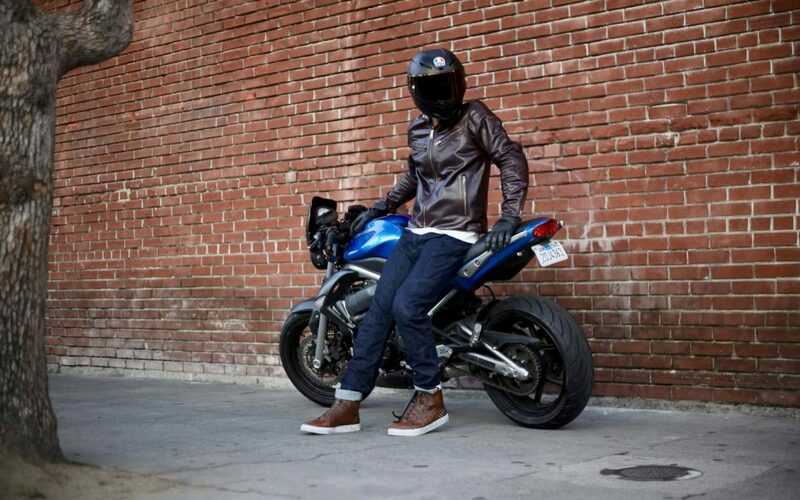 If the Rockers’ edgy style doesn’t do it for you, the Cooper boots may be a better fit. Made from full-grain leather with a hand-brushed finish, the Coopers have a classic wedge sole design with some unique details. Rigid inserts at the heels and a leather shifter pad offer protection in the right places that doesn’t diminish comfort. 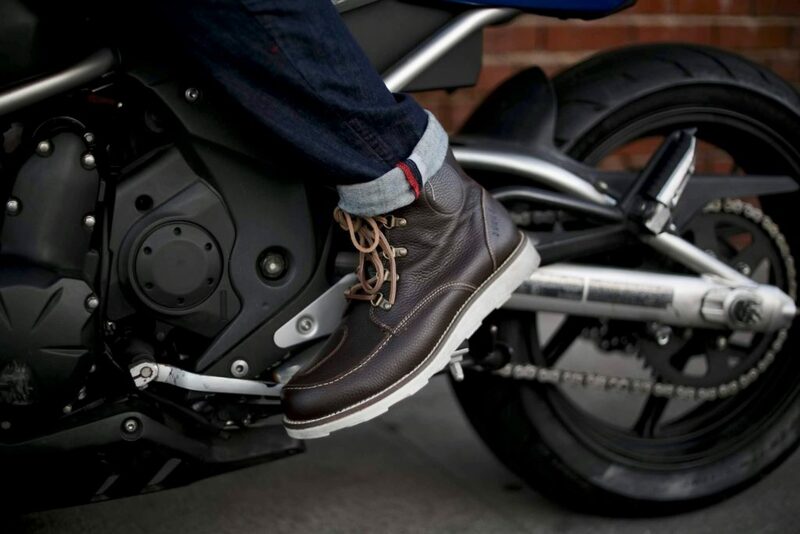 The Coopers have one of the most versatile looks of any biker boot, with leather laces, a tall (but not too tall) heel, and contrasting stitching that complements just about any type of motorcycle or outfit. Like the Street Rockers, I almost enjoy wearing the Coopers more when I’m not on a bike, but the difference here is that these feel superbly relaxed and comfortable in all settings. The Corsa R helmet features a carbon-fiberglass shell, adjustable vents, two different fabric pads (for warm or cool weather), and a quick-release face shield. Though it’s designed for track use, the Corsa R (especially in my tester’s matte black paint) is too cool not to wear on the street. An ultra light weight, cozy padding, and excellent visibility make the Corsa R a fantastic daily and performance helmet. Swapping out a tinted visor (day) for a clear one (at night) is a breeze thanks to AGV’s quick release system, or you can install a tinted Pinlock visor within the stock shield to avoid exchanging altogether. The helmet’s aerodynamic shape reduces drag, but with its vents open, the Corsa R permits a bit too much wind noise at highway speeds.